The global email marketing market is fragmented. There is intense competition in the market between players such as Microsoft Corp., IBM, Zoho Corp., Responsys Inc., and Epsilon. These companies collectively accounted for 44% of the market in 2016, states Transparency Market Research (TMR) in its new report. The competition is mainly between established players, who are providing solution and services to end use industries. High investments in various technologies and innovations for email marketing the market. Technical advancements in tools of email marketing solution and the growing research activities for the development of services and solutions will attract new players in the market. 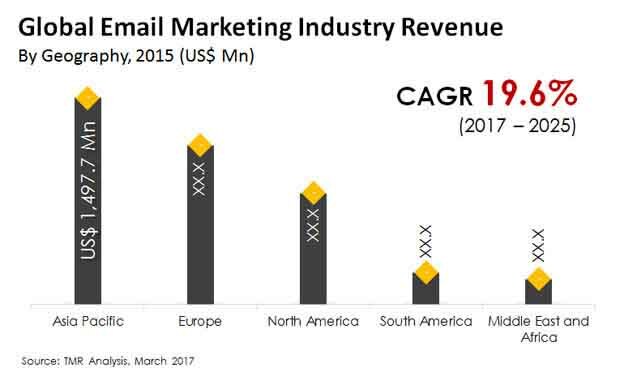 According to the report published by TMR, the global email marketing market is likely to expand at 19.60% CAGR from 2017 to 2025. The market will be worth US$22.16 bn by 2025 after being worth US$4.51 bn in 2016. On the basis of component, the software segment is expected to emerge as the leading one in the forecast period. The increasing uptake of white label software, web based software, and third party standard software is behind the growth of the software segment’s leading position in terms of components. On the basis of enterprise, the small and medium enterprises will adopt email marketing on a larger scale. Small and medium enterprises make use of the email marketing tool for targeting various groups of users to advertise their products, services, and solutions. It is estimated that the small scale enterprises in the retail or commerce business will make the most contribution to the global email marketing industry in the years to come. By geography, the market is expected to be led by Asia Pacific. The region is expected to expand at a 22.80% CAGR between 2017 and 2025. North America is expected to witness a sluggish growth in the years to come on account of the various regulatory laws. In North America, the U.S. and Canada the CAN-SPAM Act and CASL act are governing the email marketing practices. However, the growing internet penetration and increasing number of smartphone users may bode well for the North American email marketing market in the coming years. The increasing use of emails for communication and various other works is driving the global email marketing market. The number of email users is constantly increasing and this is expected to continue to drive the global email marketing market. Email is the most productive medium for advertising and marketing and by 2019 one third of the population will make use of emails. The growing awareness among users as to how email marketing provides a higher RoI rate than other forms of digital marketing will drive the growth of this market. On the flip side, the growing privacy issues and security concerns will restrict the growth of the global email marketing market.